Some Filipino cooks seem to be under the mistaken impression that every meal has to be a long production… tons of chopping, prepping, cooking an hour before the meal…etc., etc. But oftentimes, one doesn’t really want to mess around in the kitchen for that long. Our crew at home always gets discombobulated when I go into one of these “you can do a perfectly decent lunch in about 15-20 minutes max modes,” and they wait anxiously for the whirling dervish to rush into the kitchen just minutes before lunch is due and whip something up in no time. The other day it was this incredibly simple pan fried or roasted chicken breast dish with butter and lemon. It’ll take you 15 minutes max and served with some leftover potatoes, a salad or rice it is the perfect luncheon dish. The only advance planning you need is to defrost your breasts if they have been hanging out in the freezer. just wondering if dayap would be a good alternative, my mom recently gave me a lot of dayap fruit from home. That looks real good and a must try… I always have chicken breast and I kinda ran out of baked chicken ideas(I use this part a lot). Another staple is Real Lemon concentrate…I hope this will do for the actual lemons, though. i got some chicken thighs defrosting away in the fridge. this will be our dinner tonight! Woohoo! 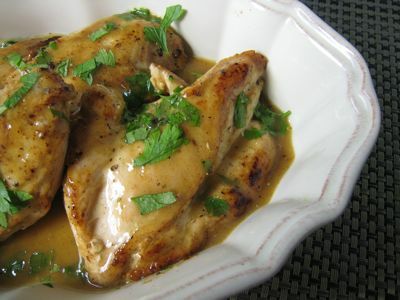 reminds me of the italian-american dish called chicken francaise. Did you get the oft-emailed list from the NYTimes about 101 meals in 10 minutes? Maybe one of your future posts can include your favorite quick meals to make. dizzy, dayap might work well..but DON’T waste your bounty, it is SO HARD to find real dayap these days…check out my recipe on Dayap Pie…it turned out really well…it was posted years ago. elaine, try just a little lemon concentrate first and adjust as necessary, though real lemons would really be ideal. Bengski and Anna, I hope it works for you guys as well. gemma, I know the dish you refer to, it does probably have similar ingredients… Mila, no, I don’t think I have seen that NYTimes list, oddly. Will check. some of the better meals i’ve cooked have been those quick “inventions” using whatever is in the fridge and garden. it’s quite satisfying when something quickly put together turn out to be surprisingly delicious. Flying to the grocery to make this for for lunch today…thanx MM! thanks for the reply, enjoyed going through your old posts (as always). 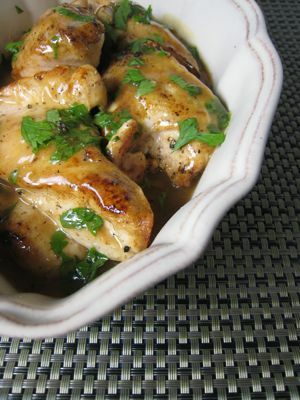 i have a date with this dish on sunday- run out of chicken breasts…thanks MM! MM just did a French move: monte au beurre – to finish the sauce by thickening with butter. Its nice to remember it has a French term when doing it, it makes the whole dish extra special hahaha. I also do this with worcestershire sauce, brown sugar and butter in the end, using it on thick slices of Christmas ham. I usually do this for a fast meal. I use a cast iron pan to brown the chicken breasts, skin side down, then pop everything into the oven. When it’s done, I flip the chicken on the pan and serve it ala sizzling plate (using same cast iron pan). I serve the lemon wedges on the table. When my hubby cooks this he’d have caramelized onions and will be roasting the boiled potatoes together with the chicken, all in the same pan. Your posts on the fried chicken are really making me hungry.. To think I just had fried chicken over lunch.. I just made this recipe here in New York City and now my apartment smells delicious and buttery. Thank you and thanks for your wonderful blog! Maripi, yes Italian parsley is flat leaf parsley. You can buy it at Rustan’s Rockwell and other groceries as well. They carry it at Santis delicatessen and they have it at some weekend markets such as Salcedo and Legaspi.